It’s not going to be that kind of list. I promise. And it made me think of some other wonderful marriages, many of which make any day – including Valentine’s Day – that much more wonderful. Peanut butter and chocolate. 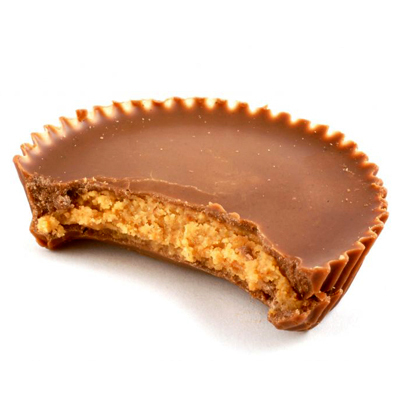 I pledge my undying love to you, Reese’s. Cookie dough and vanilla ice cream. Whoever was impatient enough to skip the whole bake-the-cookies step is a genius, and I applaud that impatience wholeheartedly. Apples and caramel. Let’s ignore the fact that we are coating vitamins and nutrients in pure sugar, shall we? We shall! Coffee and French vanilla flavored creamer. Let’s be honest. I love coffee because it’s just an appropriate vessel to binge on French vanilla flavored creamer in polite company. Laundry detergent and Febreeze. (And you thought it was all about food, didn’t you.) You know, no one would even have a date in the first place if their clothes smelled like dirty gym socks and rotting pineapples. I could go on, but we all know I’d just start talking about food again, and Fat Tuesday isn’t until next week (wocka wocka!). “I applaud that impatience wholeheartedly.” Ha! I’m right there with you. This is exactly my kind of Valentine’s Day post. Yum. My love language is DEFINITIVELY food. The end. You had me at peanut butter and chocolate. Amen. Praise the Lord and pass the Reese’s. That MIGHT just be my epitaph. Yum at apple and caramel! Happy Valentine’s day! Food Combos? Best love story ever. Great post! Thanks! What’s Valentine’s Day without FOOD? Loved this! How about grilled cheese sandwiches and tomato soup? I used to think this was not such a great relationship, but that was because I had issues with tomatoes. Now that I’ve worked through them, I’m hooked. Also, a colleague recently e-mailed me to tell me she put jelly in the fridge that I could have to go with the stash of peanut butter and bread I keep in my mailbox in the lounge. Such a classic combo.